MANILA, Philippines - The cone-shaped Mayon volcano in the central Philippines, which killed scores in an eruption 16 years ago, shot up an ash plume Wednesday — prompting hundreds of nearby residents to evacuate in case it blows again. Chief state volcanologist Renato Solidum said the alert level remains the same at Mayon, the country's most active volcano, but that if magma continues to rise below the glowing crater there could be another eruption within weeks. In Daraga township south of the volcano's crater, Mayor Cicero Triunfante ordered the early evacuation of more than 800 residents in the villages of Matnog and Banadero on fears that it might be in the path of superheated volcanic debris called pyroclastic flow. Elsewhere, officials distributed wireless public address systems to more than 700 village and town officials to help them make emergency evacuation announcements if necessary, said provincial disaster officer Cedric Daep. He said mass evacuations would be ordered once the Philippine Institute of Volcanology and Seismology raises the alert to the next higher level. About 30,000 people were evacuated when it last erupted in 2006. Officials repeated warnings over radio stations early Wednesday against mountain climbing, gathering orchids, farming and other "human activities" on the slopes of the 8,070-foot volcano, Daep said. Resident volcanologist Ed Laguerta said ground measurements showed that the upper slopes of Mayon were slightly inflated, indicating the presence of rising magma, and that minor ash explosions are to be expected. Hourly measurements were being taken, he added. Two explosions early Wednesday sent ash and rocks more than half a mile into the air. A thin layer of ash fell on the nearby towns of Camalig, Guinobatan and Ligao on Mayon's southwestern foothills. Mayon's most violent eruption, in 1814, killed more than 1,200 people and buried a town in mud. A 1993 eruption killed 79 people. Typhoon-triggered mudslides near the mountain in 2006 buried entire villages, killing more than 1,000 people. The Philippines is in the Pacific "Ring of Fire," where volcanic activity and earthquakes are common. (CNN) -- Philippines authorities Tuesday started evacuating about 50,000 people living around the island nation's most active volcano after it oozed fiery lava and belched clouds of ash. A large-scale eruption was forecast as imminent. The Philippine Institute of Volcanology and Seismology raised the alert level up a notch on Monday night to level 3. Scientist Alex Baloloy told the Philippine News Agency (PNA) that under level 3, "a full-blown eruption is expected to take place within weeks to days." He said seismic instruments detected 83 volcanic quakes, a majority of which were tremors associated with rockfalls. People in Albay province, about 466 kilometers (290 miles) south of the capital, Manila, flocked to town centers to catch a glimpse of glowing lava cascading down the slopes of Mayon. The volcanic mountain soars 2,464 meters (8,077 feet) into the sky and has erupted 49 times since the first documented erupted in 1616. Ash fell on the town of Guinabatan, prompting its mayor to predict an unwanted sort of white Christmas, PNA said. Provincial Gov. Joey Salceda, ordered mandatory evacuation for residents of 45 towns and cities within a radius of 6 kilometers (3.7 miles) around Mayon, including Legazpi, Ligao, Tabaco, Daraga, Camalig, Guinobatan, Malilipot and Santo Domingo. The Albay Public Safety Emergency and Management Office said 9,946 families or 47,285 people were expected to be moved to safer ground within 72 hours, PNA reported. Salceda, who canceled a planned trip to Denmark for the global climate conference in Copenhagen, said he will meet with the provincial disaster coordinating council Tuesday to discuss emergency measures in case of an eruption, according to PNA. The Philippines is situated in the so-called Ring of Fire, an arc of fault lines circling the Pacific Basin that is prone to frequent earthquakes and volcanic eruptions. Mayon's most violent eruption, in 1814, killed more than 1,200 people and devastated several towns. Its last major eruption was in 1993. Since then, it has emitted ash and spewed lava but remained restless. AP) MANILA, Philippines — The Philippines' most active volcano oozed lava and shot up plumes of ash Tuesday, forcing thousands of people to evacuate their homes and face the possibility of a bleak Christmas in a shelter. State volcanologists raised the alert level on the cone-shaped, 8,070-foot (2,460-meter) Mayon volcano overnight to two steps below a major eruption after ash explosions. Dark orange lava fragments glowed in the dark as they trickled down the mountain slope overnight. Renato Solidum, head of the Philippine Institute of Volcanology and Seismology, said the activity could get worse in coming days. "It's already erupting," Solidum told The Associated Press. More than 20,000 people were evacuated to safety by nightfall Tuesday, said Gov. Joey Salceda of Albay province, where Mayon is located about 210 miles (340 kilometers) southeast of Manila. The first of 20 vehicles, including army trucks, were sent to villages to take residents to schools and other temporary housing, provincial emergency management official Jukes Nunez said. "It's 10 days before Christmas. Most likely people will be in evacuation centers, and if Mayon's activity won't ease down we will not allow them to return to their homes," Nunez said. "It's difficult and sad, especially for children." 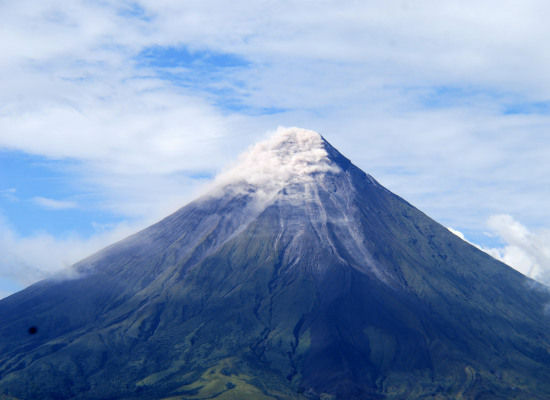 Residents in Albay are used to moving away from Mayon. Nearly 50,000 people live in a five-mile (eight-kilometer) radius around the mountain, and some villages were evacuated last month when the volcano spewed ash. Cool pics, L! Thanks for posting! (CNN) -- Philippine authorities on Sunday raised the alert status of the country's most active volcano to level 4 and established an extended danger zone around it, saying an eruption is imminent. The status change at the Mayon volcano "means that a hazardous explosive eruption is possible within days," according to the Philippine Institute of Volcanology and Seismology. Earlier Sunday, the institute said the central Philippine volcano continues "to exhibit a high level of activity," adding that 222 volcanic quakes and tremors have been recorded in recent days. One was "an explosion-type earthquake" that launched a cloud of ash about 1,640 feet (500 meters) into the air, according to an institute statement. The institute recommended extending already-established danger zones of nearly five miles (8 kilometers) south of the summit and 4.3 miles (7 kilometers) north of the summit. In addition, "areas just outside of this extended danger zone should prepare for evacuation in the event explosive eruptions intensify," the institute said. More than 30,000 people fled their homes last week ahead of an expected eruption, and authorities were attempting to evacuate about 50,000 people living around the 8,077-foot volcano. People in surrounding Albay province have flocked to town centers to catch a glimpse of glowing lava cascading down the slopes of Mayon since the mountain began oozing fiery lava and belching clouds of ash last week. The volcano, about 310 (500 kilometers) south of the Philippine capital of Manila, has erupted 49 times since its first documented eruption in 1616. The Philippines is situated in the so-called Ring of Fire, an arc of fault lines circling the Pacific Basin that is prone to frequent earthquakes and volcanic eruptions. In 1814, Mayon had its most violent eruption, killing more than 1,200 people. Its last major eruption was in 1993. Since then, it has remained restless, emitting ash and spewing lava. (CNN) -- Fountains of red-hot lava shot up from the intensifying Mayon volcano as the Philippines awaited an imminent eruption, the country's national news agency reported Tuesday. Tens of thousands of people have already fled their homes. More than 9,000 families -- a total of 44,394 people -- are being housed in evacuation camps after authorities raised the alert status of the country's most active volcano, Albay Province Gov. Joey Salceda said. The Philippine Institute on Volcanology and Seismology was considering ratcheting up the volcano alert to the highest level, which would mean an eruption was underway, the Philippine News Agency (PNA) reported. But officials said not everyone is heeding their warnings -- some villagers were spotted within the danger zone checking on their homes and farms on the foothills of the volcano. The government is trying to enforce a "no man's land" rule in the designated danger zone, with military and police instructed to double the personnel manning the nine checkpoints and double their foot patrol operation inside the restricted area, PNA reported. "Mayon continued to show an intense level of activity during the past 24-hour observation period. Seismic activity remained elevated in number and size as the seismic network detected a total of 1,266 volcanic earthquakes," it said in a statement about the last 24 hours to 7 a.m. local time on Tuesday (6 p.m. ET on Monday). The volcano, located about 500 km (310 miles) south of the Philippine capital of Manila, has erupted 49 times since its first documented eruption in 1616. The Philippines is situated in the so-called Ring of Fire, an arc of fault lines circling the Pacific Basin that is prone to frequent earthquakes and volcanic eruptions. Mayon's most violent eruption, in 1814, killed more than 1,200 people and devastated several towns. Its last major eruption was in 1993. Since then, it has remained restless, emitting ash and spewing lava. MANILA, Philippines -- Thousands of villagers evacuated from near the Philippines' most active volcano headed home Saturday after scientists said the rumbling mountain was showing signs it was calming down. The Philippine Institute of Volcanology and Seismology early Saturday lowered a five-stage alert over Mayon volcano from level 4 to 3, saying there was "less probability of a hazardous explosive eruption." Most of the 47,000 evacuees whose homes are within a 5-mile (8-kilometer) danger zone have been told it is safe to return home, said Cedric Daep, head of the disaster management office of Albay province, about 212 miles (340 kilometers) southeast of Manila. Only about 5,000 whose homes are on the southeastern slope of the volcano and in the path of lava flows remained in shelters, he said. Chief state volcanologist Renato Solidum said scientists were closely monitoring the volcano and will raise the alert in case of a resurgence of activity. "At the moment, the activity of the volcano is declining, but the volcanic unrest is still high," he said. 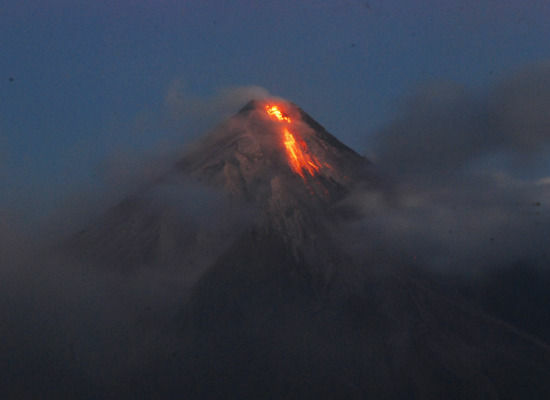 The institute said in a statement that it noted "a declining trend in Mayon volcano's activity." It cited the absence of ash ejections over the past four days, weak steam emissions, declining amounts of sulfur dioxide gas - an indicator of rising magma. It also said majority of earthquakes recorded in the past days have been associated with rockfalls, not rising magma. THEN I saw these: The 6.2 apparently occurred shortly after the above article was posted.